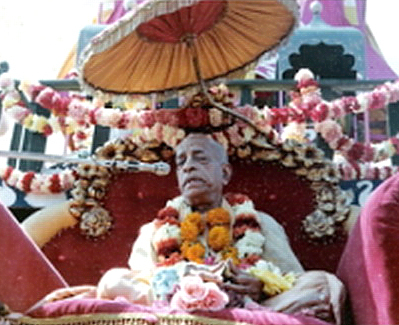 "As Krsna is living eternally, similarly, living being also lives eternally. But kirtir yasya sa jivati: One who does service to the Lord lives forever.' So you have been taught to serve Krsna, and with Krsna we'll live eternally. Our life is eternal. Na hanyate hanyamane sarire. A temporary disappearance of this body, it doesn't matter. Body is meant for disappearance. Tatha dehantara-praptih. So live forever by serving Krsna. Thank you very much."